Cincin means Cheers in Italian! It was a pretty fun word to say when you are enjoying wine and celebration with your friends. Say Cincin and everyone will lift up their wine glass and cheers. Wanted to enjoy some nice and sweet celebration with your friends? 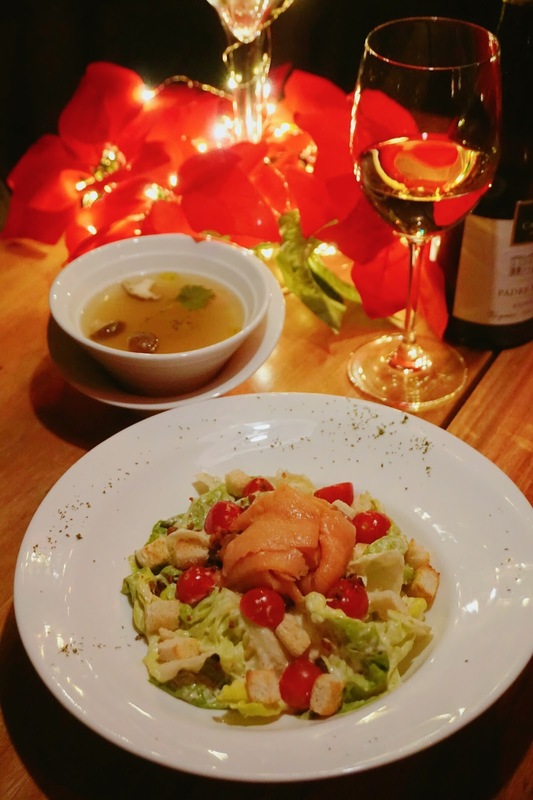 Cincin is the first cozy and elegant restaurant in Cheras area. 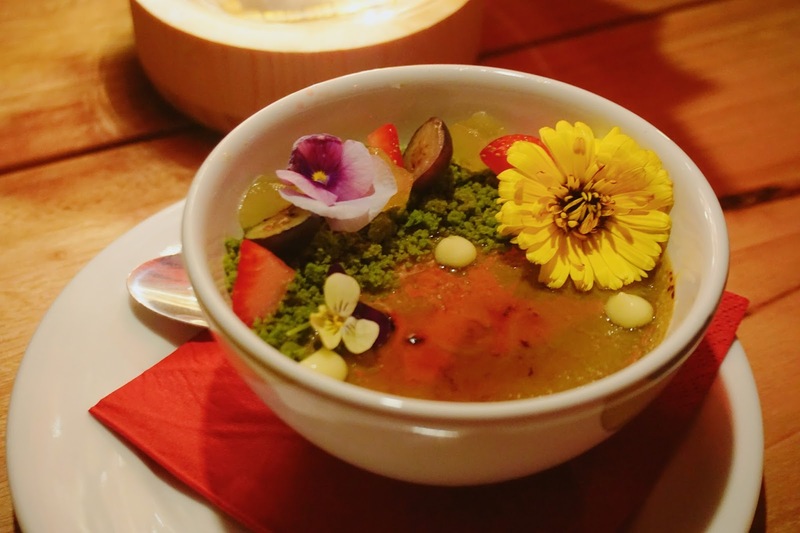 It serves a great range of Fine Western Cuisine. 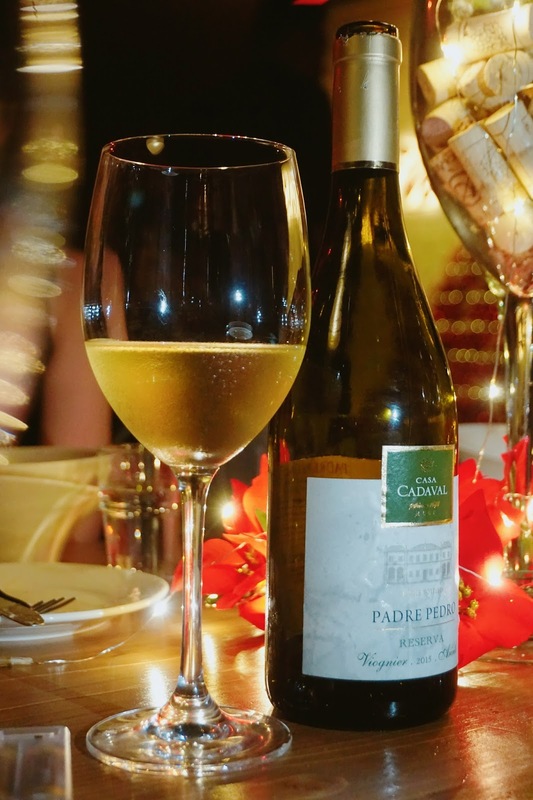 Not only that the food is really nice and awesome, they also have a good selection of Premium Wines for you and your friend to try out! 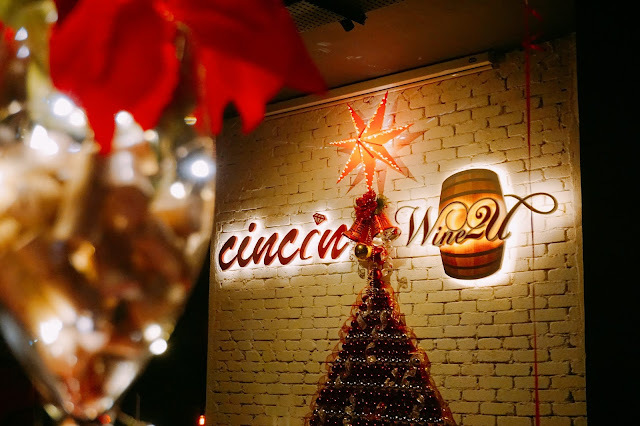 At Cincin, there is 2-storey restaurant, where the ground floor serves mainly for beer and casual night out dining with friends. As for the first floor, where it will be more a formal ground, where guest can enjoy fine dining and wine tasting experience. 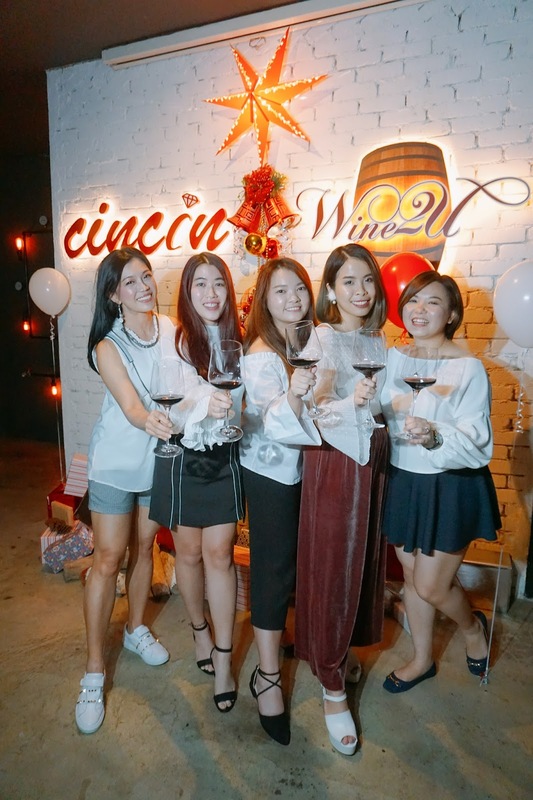 Make sure you dress up too during your wine dining experience at Cincin. 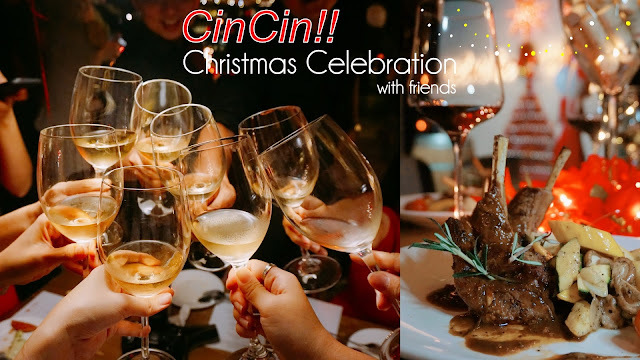 Christmas celebration can be so much fun too in Cincin. I love their decoration which comes in really fun and happening Christmas festive season. We start with our wine pairing with their white wine which is Viognier and Arinto from 2015. 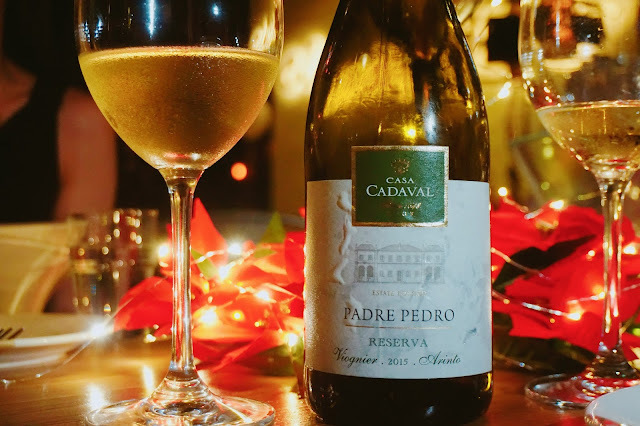 This white wine is the perfect match for the first 3 courses of the menu. I really enjoy myself with this plate of salad which is appetizing due to the sauce they mix with! It was mix with cheese and gives the appetizing flavor. 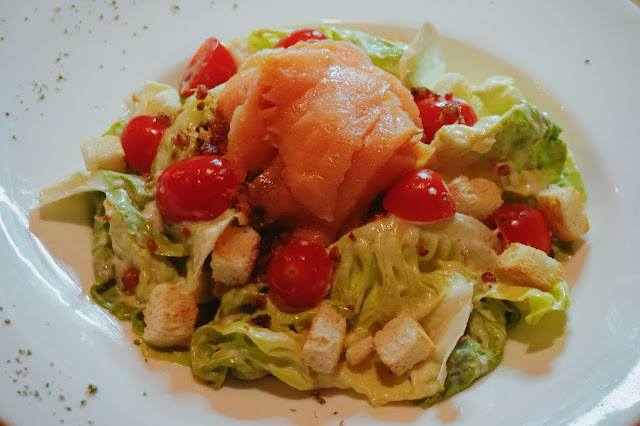 Salmon slices is a must for me when it comes to Caesar salad. Super Good with White Wine!! This dish has really been my favorite so far! Perfect pairing with the white wine. Sip a small sip of white wine and goggle it inside your mouth. 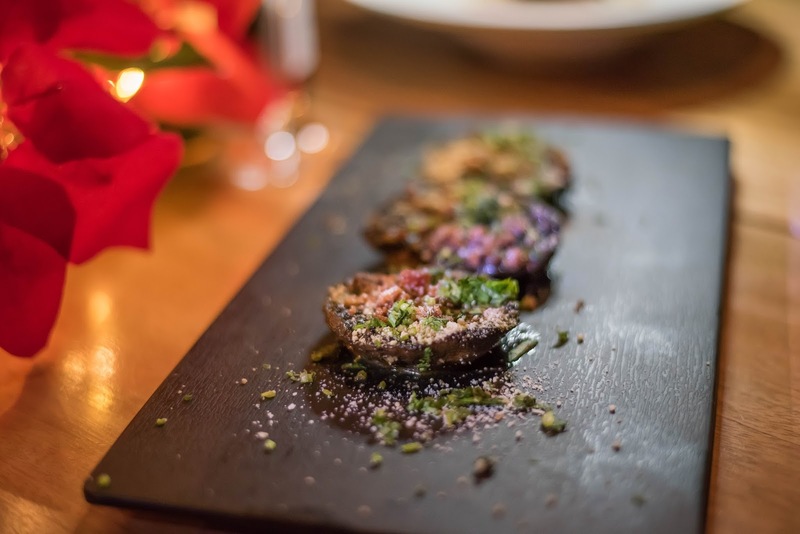 Next, eat one bite of the portobello. Lastly, drink another sip of white wine. 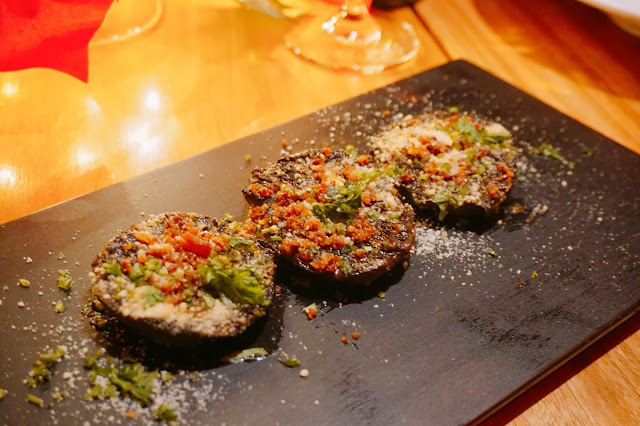 The flavor of the Grill Portobello just burst into my mouth, it was so strong but somehow I really enjoy the strong taste of the Grill Portobello inside my mouth. It somehow also brings out the nice scent of the White wine too when I sip after I ate the grilled portobello. I love how fresh and juicy the salmon are. 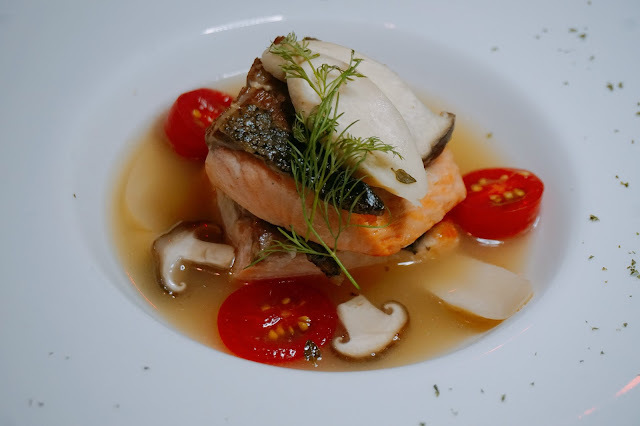 Thick texture salmon is the best, it comes with really soft and tender texture too. 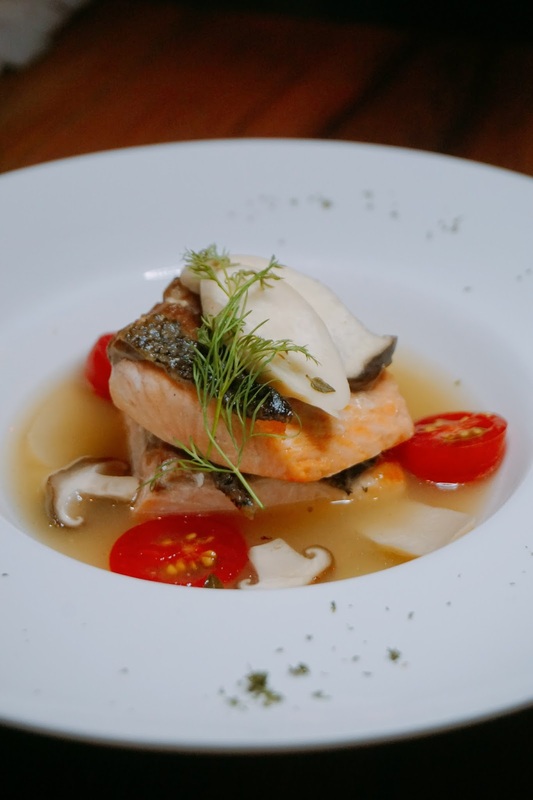 As for the broth, it was so refreshing where you taste the wine from the aftertaste of this salmon with broth. Such an interesting combination flavor to try on! 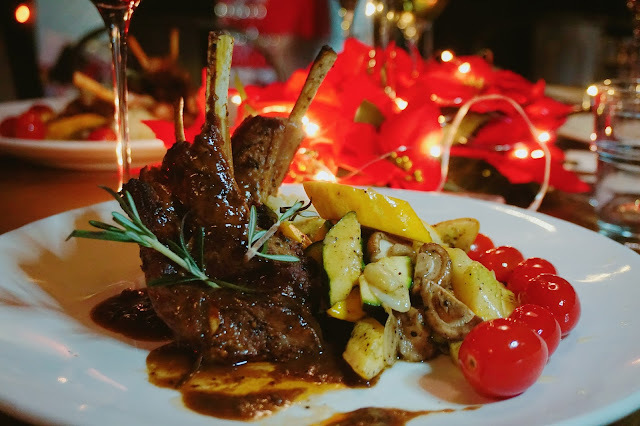 Lamb Shank is my must try the food dish when I dine in at any western cuisine restaurant. Black pepper is the perfect combi sauce when it serves with Lamb Shank. Their lamb shank is so chewy and tender. I enjoy their lamb shank a lot with the black pepper sauce so much. Hojicha and Cheese is Love! How can we forget about desserts when all of us girls dine in! This creme brulee is by far the most creative and special creme brulee I ever try! Hojicha flavor and Green tea powder on top? The combination is so refreshing and yummy. I wouldn't say that it was not sweet at all, but some may prefer to be more bitter. For me, I prefer it taste this way more creamy and comes with this really nice bitter flavor of hojicha. Super addicting! 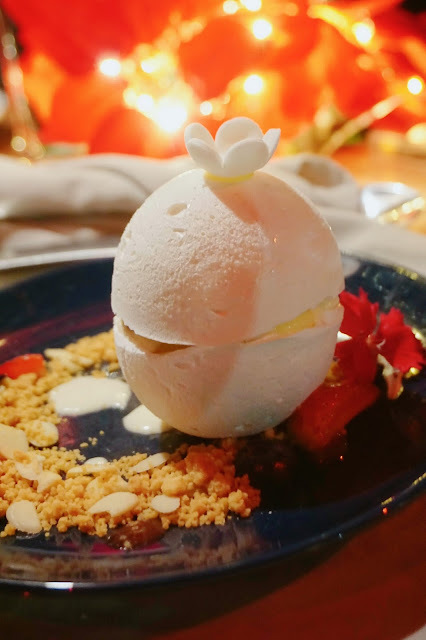 Lastly, this Ballerina is such a cute and fun desserts serving I have ever seen! You will have to hit and knock on the top of the mold when you ate it. The crispy outer taste not that bad at all with the Vanilla ice cream inside. 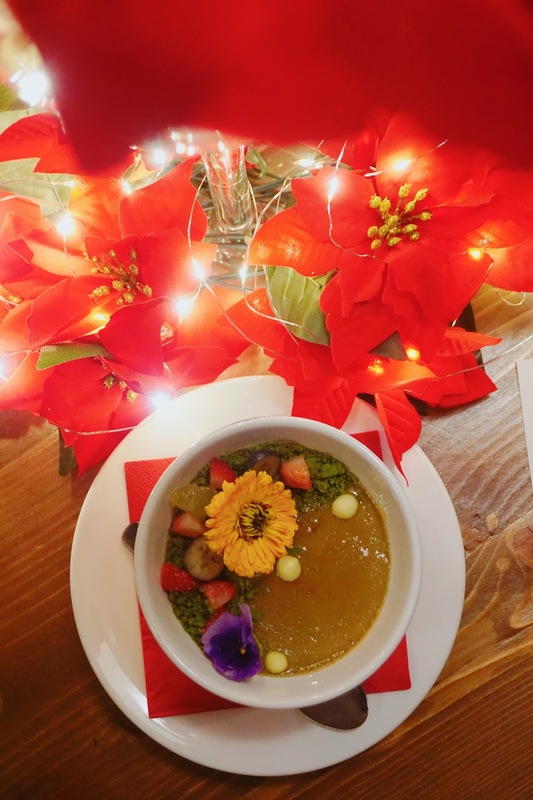 If you are do not prefer desserts that are too sweet like the creme brulee, I will recommend you to try this out to fix your craving for desserts after the meal! I am really enjoying my night here at Cincin with my dear friends and bestie. It was really fun and happy to able to catch up with friends. Mingle around and enjoy the wine and food together! This is what best friends should do together. Not only that you can enjoy a fun and nice girls night out with friends. Do join Cincin membership, so that you are entitled one crystal wineglass store in Cincin for Free and a charm with your name with RM500 wine purchase in a total of 3 bills in a month. 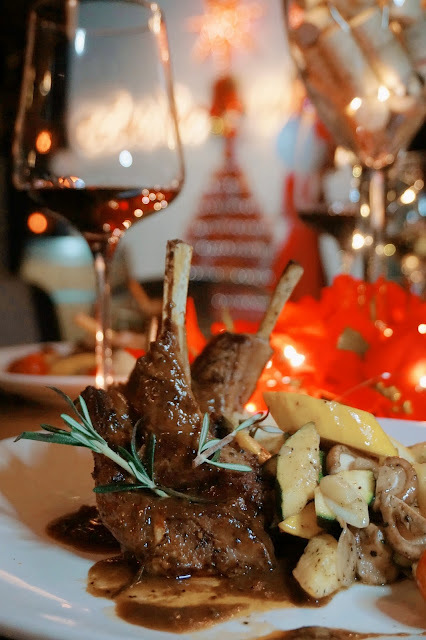 Christmas dinner will start at 22nd until 25th December, you will get to enjoy live carving turkey and lamb leg serve to your table. Salad, soup, and cold cuts will be available in buffet style too! Do follow Cincin facebook page for more info and updates! This place is perfect! Glad you discovered it. Saving this for my next trip! Remember to check it out when you visit Malaysia! Ballerina is too cute to be eaten. Such a nice place with good food and wine. Some food taste better with wine! 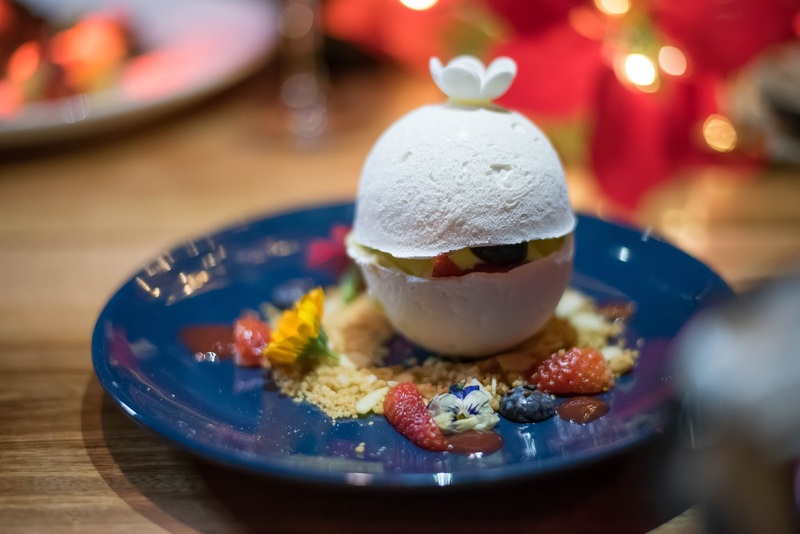 Looks like you had a great Celebration there at CinCin. So beautiful place and the foods are amazing, perfect place for Christmas Eve Celebration. What a funny word in Italian to mean Cheers when it means ring in Malay. I will try to remember the word and use it appropriately. Good food and fine ambience. Hope to drop by one day. Wahh. I thought cincin as in the ring, but it means cheers. What a great choice of name for wine/ bar restaurant.